The Twentymile Trailhead kiosks are located just below the Ranger Station. The lower parking area is located near the kiosks. The upper parking is located beyond the Ranger Station and shed. We were not sure where the official trailhead was located. The location probably does not matter to anyone other than for gathering data. There is a picnic table at the upper parking area. The emergency phone on the front porch of the Ranger Station would not connect to the Backcountry Office. We did not try using the emergency number. I filtered water from one of the side feeder streams located near the Ranger Station on our return. None of the trails were marked with trail blazes. Directional signs and mileage signs were located at all junctions and/or non-obvious changes in direction. The first 0.50 mile of the trail is a great warm up hike. This section is used by Long Hungry Ridge and Wolf Ridge. We climbed Long Hungry Ridge and descended Wolf Ridge. It was a great loop. It is hard to rate the difficulty of a trail when only hiking downhill. However, I generally enjoy the uphills and dislike most downhills. The steeper the grade the more disdain I would have for going down the trail. Still, I really enjoyed Wolf Ridge. I believe I would really enjoy the climb up the route. When we climbed Long Hungry Ridge, we had four stream crossings. On the Wolf Ridge Trail, all of the crossings were on bridges. Five of the crossings were on footbridges. A few words of caution about the footbridges: The bridge beams seemed strong, even though one log in particular was very long. The tread on the logs varied. Sections of the tread could be slick. All of the footbridges had handrails. The handrails leaned away from the footbridge. A child would have difficulty using the handrail. A fall from the footbridges would be unhealthy. 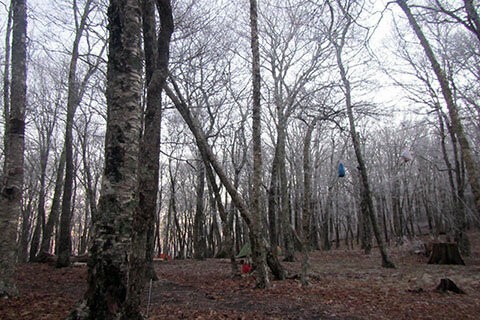 Dalton Branch Campsite is 2.45 miles from the trailhead and would be a good destination if you planned to arrive at the trailhead in the afternoon. The Wolf Ridge Trail is a multi-use trail. It is open to horses, as well as hikers (and runners for that matter). The trail was still in very good condition. Leaving Dalton Branch the trail narrows and climbs. There were a couple of places where the trail was cut across a very steep slope. Water is available (seasonal) on the the first 1.5 miles of the climb from Dalton Branch. I would still, fill my water containers (filtered or treated) at Dalton Branch, a natural rest stop. It is a good climb to Parson Bald. The trail climbs close to 2400 feet in 3.60 miles. There is a location sign at the summit of Parsons Bald. The Sheep Pen Gap Campsite can be reached by four routes - Gregory Bald Trail, Gregory Ridge Trail, Long Hungry Ridge Trail and Wolf Ridge. It is a popular destination, plan accordingly. A H2O is carved into the trail junction sign. The arrow points down the Gregory Bald Trail. 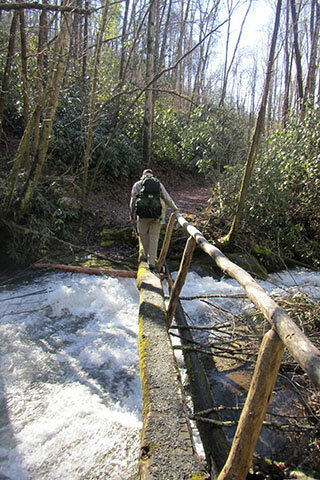 The water supply is a creek that crosses the Gregory Bald Trail. 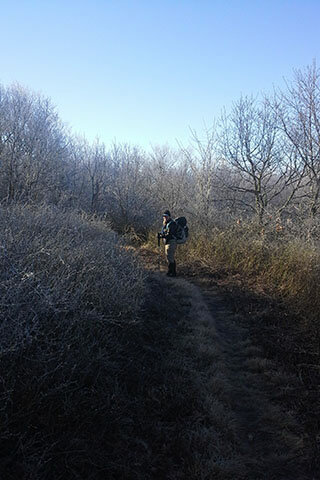 The Gregory Bald Trail from Sheep Pen Gap Campsite to the summit is short. It would be an easy evening walk to the Bald if camped at the Gap. The summit benchmark is placed in a triangular rock! Wolf Ridge could be used in combination with other trails to make a good loop. We followed Long Hungry Ridge to the summit and descended Wolf Ridge, but the route could be done in reverse. For more combinations of area trails just search a good map!